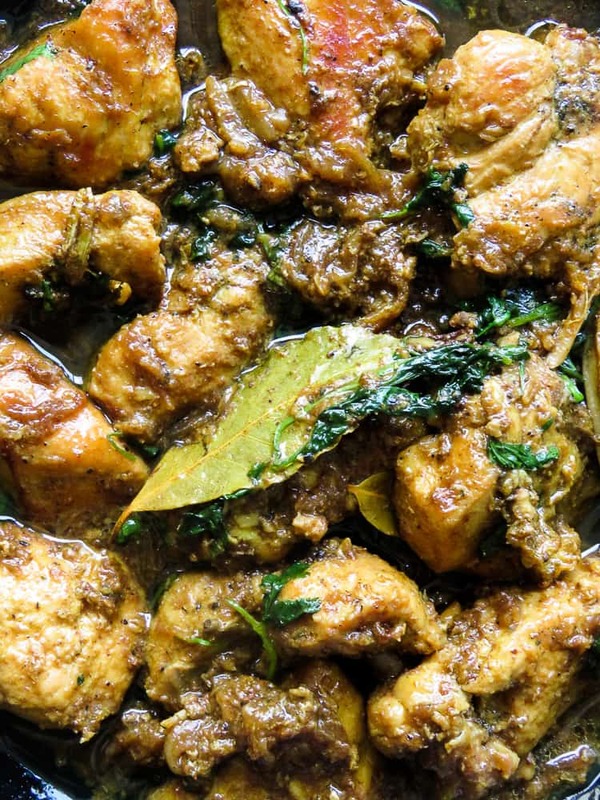 Cardamom infused ginger-garlic chicken, bold flavors that packs a punch in to your meals. Comfort food never looked so good. There is a reason I enjoy cooking poultry than any other meat, they are easy to flavor and just about any marinade you use, guarantees a tasty dish. The dishes that end up here on the blog is what my family have as meals. Actually, letting you family taste it first, especially kids can be scary as they are brutally honest when it comes to dishing out opinion. I gues they think this is the chance to get back at mama for her bossy opinions. There have been times when they’ve point blank told me not to add a recipe to the blog because they believed no one will like it, so be rest assured every recipe goes through a four stage quality taste. While my family does the taste test, I worry about the ease of making the dish, if it’s healthy, affordable and different. “Boring”,”It tastes the same” are some of the words my kids like to use when I cook a dish that doesn’t, well tingle their taste buds. that’s one other test that the recipe need to pass through. My challenge is and always has been to cook different with the same key ingredients. Oh and this part, the writing and convincing you to try recipes like this delicious Cardamom chicken. Chicken tends to be my weekly key ingredient that I find ways to cook different. This recipe is another example of how chicken, with a combination of Cardamom and Pepper adds a distinct aroma and taste to the dish. How would you describe this dish? Cardamom has its unique taste and flavor that is easily recognized and you’ll know there’s quite a bit of it in this dish with your first taste.Strong flavors with tones of warmth from pepper makes this dish quite unique in taste. 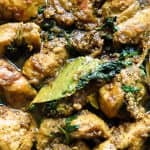 How can I serve this Cardamom, ginger-garlic chicken? As I mentioned earlier, the flavors are bold and in simple terms I would describe the dish as quite a “heavy” meal. keeping this in mind, I would say, everything that accompanies this dish should be light and green, a slightly fruity salad or a side-dish with couscous, gently roasted vegetables are great options. Carbs are up to you but keep it light. Servings for a single person or two? Use single breast fillet, leg, thighs or drumstick for single or serving for two. reduce the marinade to teaspoons and you’ll be good. 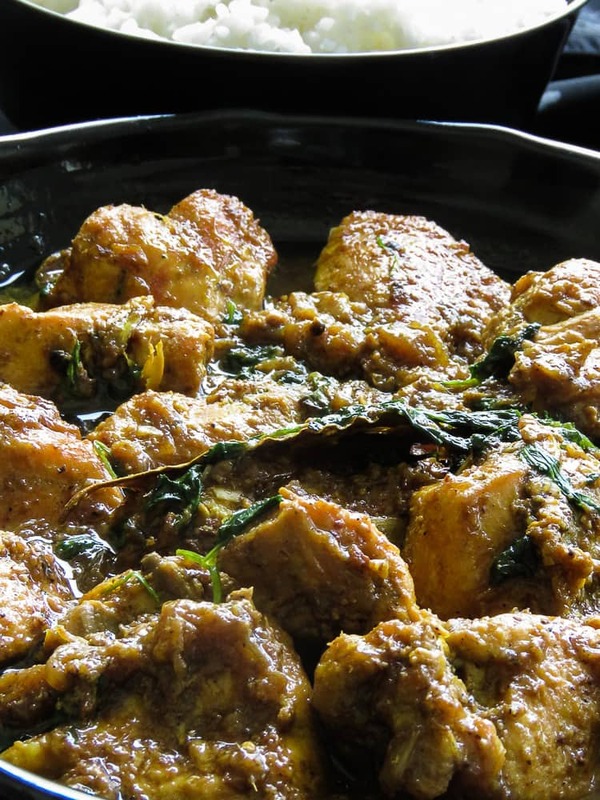 Recipe – Cardamom infused ginger-garlic chicken. Notes- The Cardamoms used here, it would be preferable if you can take out the seeds and use only the seeds. The skin of the Cardamom can be a bother when you come across it while enjoying the dish. Be cautious with the seasoning of Salt as the marinade already has enough of the same. Pound Ginger and Garlic a paste needed for the recipe. Add Cardamom, Pepper, Turmeric, Salt with the ginger-garlic paste and pound until all ingredients are mixed together. Place the Chicken in a bowl and marinade them with the pounded paste, thoroughly rubbing the spices into the chicken. Cover with a cling film and leave it to marinate for one hour but should you have time an overnight soak in the spices would be preferable. Once the marination process is done, take the chicken out 30 minutes before you begin making the dish. Let the chicken reach room temperature, place a pan over medium heat, pour in the oil, let it heat and then add the sliced Onions, Bay leaves, cinnamon and sauté for a few minutes. Add one ingredient at a time and let it cook for 2-3 minutes followed by the next. Once the Onions turn golden over medium-heat, add the marinated chicken and let them fry then slightly char edges of the chicken. While the above cooking process happens, keep mixing the chicken to avoid burning but let the spices stick to the pan as it is unavoidable. this should take less than 20-30 minutes over medium heat. Once cooked for 20-30 minutes, Pour in water, simmer until gravy is reduced by half while scraping the spices off the pan using a wooden spoon. This would help to flavor the remaining gravy. Mix all the scraped spices into the gravy. Season with Salt(see notes), garnish with Coriander mix into the chicken and serve warm. Place the Chicken in a bowl and marinate them with the pounded paste, thoroughly rubbing the spices into the chicken. Once the marination process in done, take the chicken out 30 minutes before you begin making the dish. Once the Onions turn golden over medium-heat, add the marinated chicken and let them fry then slightly char the edges of the chicken.